SME V Series 5 Precision Turntable Pick Up Tone Arm. Available with Online Finance and Free Delivery. In common with any mechanical device the behaviour of a pick-up arm is governed by three properties of matter that also define the laws of motion. The first property is mass which opposes any change in motion. The effective mass of an arm and cartridge resists motion least at low frequencies but increasingly as frequency rises. It is this resisting force which makes the operation of a cartridge possible. At subsonic frequencies the armature and stator move as one allowing the slow movements needed to negotiate the record surface without generating a signal. At audio frequencies however the increased resisting force causes the armature to move relative to the stator and a signal is produced. The transition point between these two conditions is important for a clean low frequency response and is established by the compliance of the cartridge and the total effective mass of the arm and cartridge body. The second property is stiffness which resists bending or flexing. It is a restoring force, proportional to position or deflection. Although the proportions of the Series V tone-arm reflect these facts, tests showed that the required stiffness was still unattainable using conventional fabricated construction. A one-piece die-casting in magnesium alloy was therefore adopted comprising the shell, tube and balance weight cantilever. 36% lighter but only 25% less stiff than commonly used aluminium, a magnesium arm of the same mass could be as much as 25% stiffer. In addition die-casting would allow the numerous changes of section required to optimise effective mass and control standing wave effects. Finally magnesium's high self-damping factor was augmented with an internal constrained layer to damp the tubes’ high frequency resonance. The Series V's excellent vibration analysis results owe much to the high stiffness and damping of its tone-arm, but stiffness to be of value must refer to something rigid. Tests disclosed the many points at which rigidity could be lost so all other principal parts were pressure die-cast allowing each to be tailored precisely for its purpose and utilising the high mass of zinc-based alloy to damp out vibration. Ultra-high quality 10mm and 17mm radial shielded bearings were selected to provide low friction vertical and lateral movements, while holding the tone-arm motionless against front/back and torsional forces. The support afforded by these large, wide contact angle bearings, excludes the possibility of chatter and wear or damage in normal use. The weight housing is undersung to correct its centre of gravity and provide a vibrationally non-reflective termination of the tone-arm. A damped two-point suspension carries the tungsten-alloy balance weight . Its unique shape enables it to be positioned close to the fulcrum reducing inertia to minimise the effects of record warp and eccentricity. Movement is made along mitre-ways by rotating a thumb wheel and leadscrew carried in twin ball races. Only l9mm of travel is required to cover the whole balance range and a lever effects clamping in any position. Electrical aspects received no less attention. The internal wiring is of specially developed silver litz, each conductor having five insulated strands. The damped output-socket swivels allowing it to take up its own position for installation and to minimise vibration transmission when used on a sub-chassis. The high quality silver hybrid audio lead selected for its electrical and mechanical characteristics is terminated at one end with SME right-angle 5-pole DIN contra-plug and gold-plated phono plugs at the other. Unique one-piece pressure die-cast tone-arm utilising the advantages of magnesium, replace conventional fabricated construction. Internal constrained layer damps minute residual vibration leaving the tone-arm acoustically inert. Fine machined cartridge platform, enamel free to avoid interface resonance. A Stainless steel cross shaft, ground and thread ground. Carried in massive yoke on 10mm ball races. Axis at record mean level to minimise warp-wow. Dynamic balance graduated vertical tracking force (VTF) control applies 0-3g x 0.125g through resonance controlled spring. 23mm diameter steel pillar, heat treated, ground and honed, carries two 17mm ball races, widely spaced to resist tilt. Subsonic lateral mode fluid damper can be instantly adjusted or cancelled. 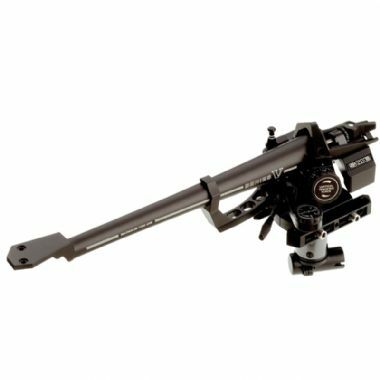 Underslung weight housing corrects centre of gravity and provides non-reflective tone-arm termination. Adjustment leadscrew journalled in twin ball races with lever clamping. Swivelling damped output socket minimises vibration transmission in sub-chassis use. Fine adjustment of arm height (VTA). New design alignment protractor sets HTA with greater accuracy.